Lauralee Bliss may well be the dean of AT ridgerunners. 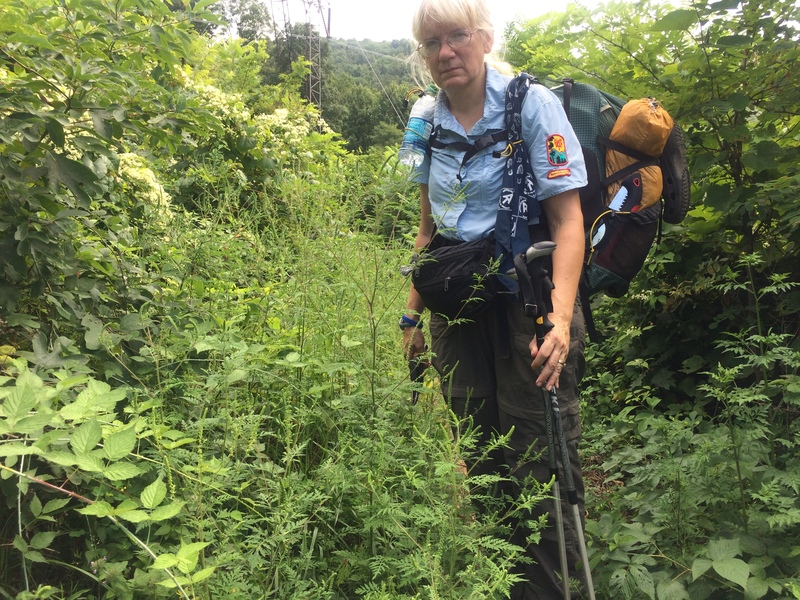 Shenandoah National Park, VA, August 15-17, 2015 — I now coordinate five ridgerunners who patrol the 240 miles of the Appalachian Trail (AT) for which the Potomac Appalachian Trail Club (PATC) is responsible. While I am a volunteer, they are paid a modest stipend for their summer work. Lauralee’s multi-year tenure and the volume of unsolicited praise from hikers pretty much says it all. I’d heard a lot of good things about her long before actually making her acquaintance at a National Trail Day event earlier this summer. 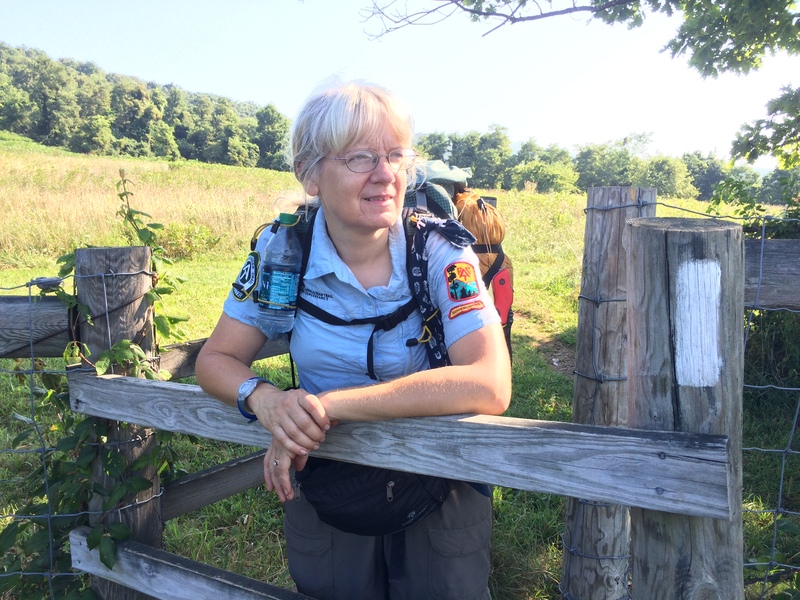 Last Saturday, after completing my work with PATC’s North District Hoodlums trail crew, I hiked in to meet Lauralee at Black Rock hut located at northbound mile 882.3 on the AT. From there we would hike to McCormick Gap at mile 865.3 with a second overnight stop at the Calf Mountain hut in between. 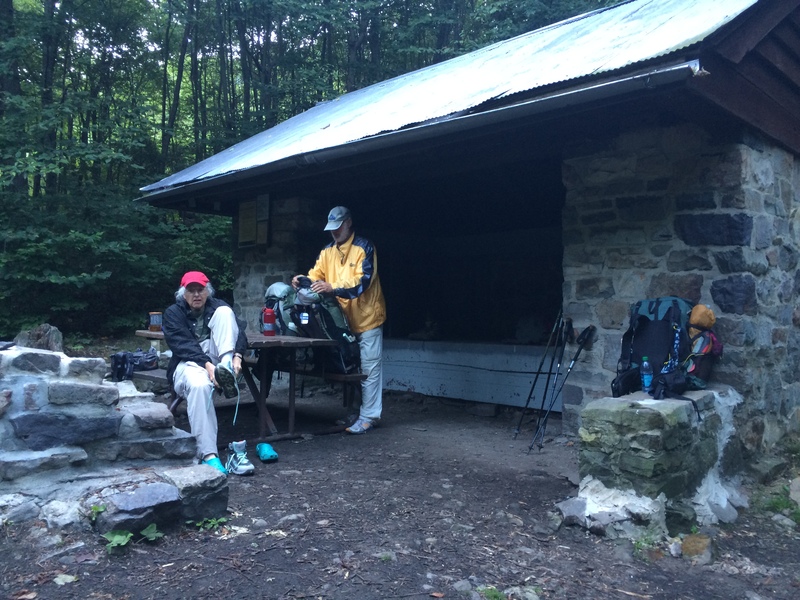 A very nice couple, former thru hikers, joined us at Black Rock. Lauralee tents. I hung my hammock. Along the way we swapped ridgerunning stories and performed minor trail maintenance including clearing some minor blowdowns and picking up micro trash. Our first adventure happened bright and early the first morning. We stopped to snag the TP someone had left next to the deposit they’d plopped just a couple of feet off the trail. As Lauralee shed her pack with intentions of parking it, I noticed a copperhead lolling in the leafy landing zone, perfectly camouflaged as they are. When ole “Jake No Shoulders” slid into a new residence amongst the discarded TP we decided let it be and wait for another time, discretion is the better part of valor you know. That’s the only mess we didn’t clean up. Lauralee checking in with Shenandoah dispatch. Many ridgerunners are issued radios that connect them to the various forms of support they need. 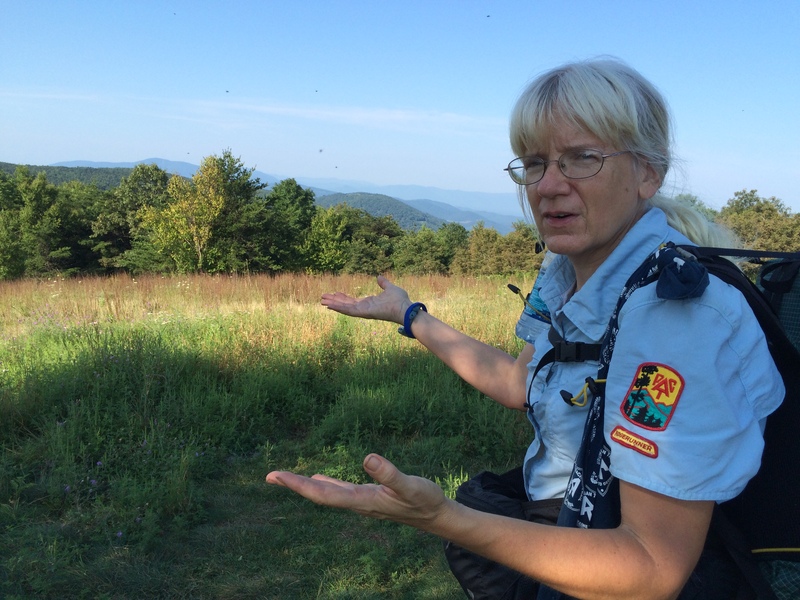 She’s standing next to Skyline Drive which is the primary front country feature of Shenandoah National Park. The first day was a hot one. Toward the end, my IT band was talking back loudly and with authority, but what the hey, it’s all in a day’s work. At one point I saw a branch strangely sticking out of the ground and partially blocking the trail. I judged it to be a tripping hazard. Wrong! It was plugging a yellow jacket nest. Along the way we heard about a boisterous southbound Boy Scout troop which had camped at the Calf Mountain hut. 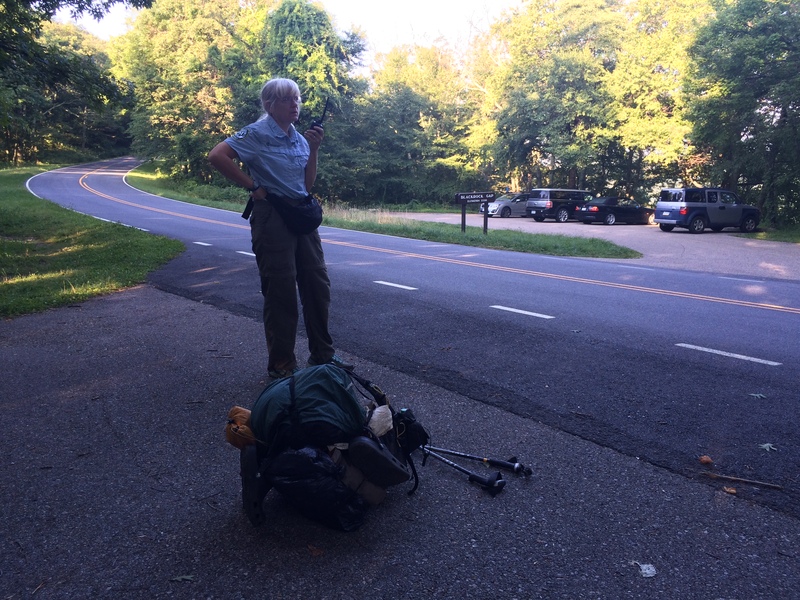 Negative reputations travel fast on the AT. We didn’t know what to expect, but experience has taught each of us not to hope for much. We weren’t disappointed, though it could have been much worse. Trash left by the Boy Scout troop. We only wish they had signed the shelter register. We love return addresses when we find trash. The pot was full of uneaten food. 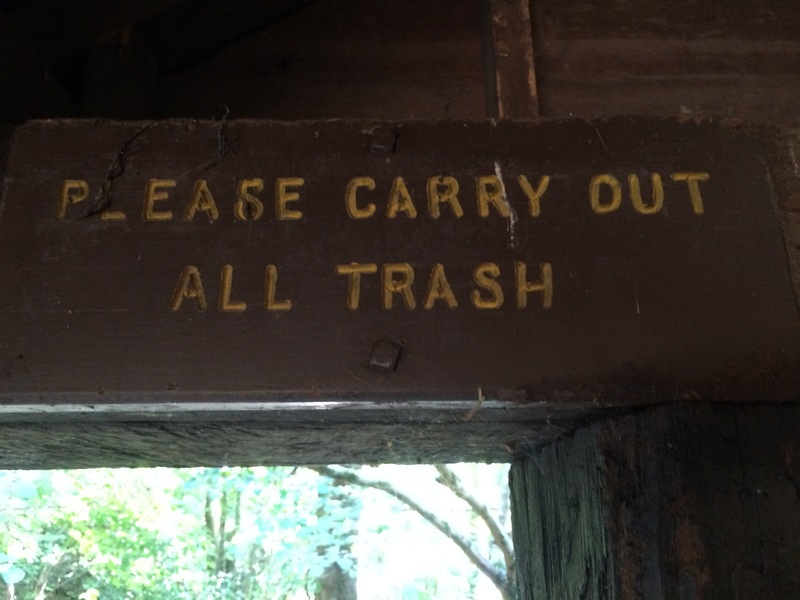 Of course the trash was right next to this sign. A contractor mows parts of this section since its distance from population centers makes recruiting overseers difficult. The vegetation alongside the trail is an invasive species called Japanese stilth grass. Stealth grass would be more like it. The stuff sneaks right up on you with overwhelming force! 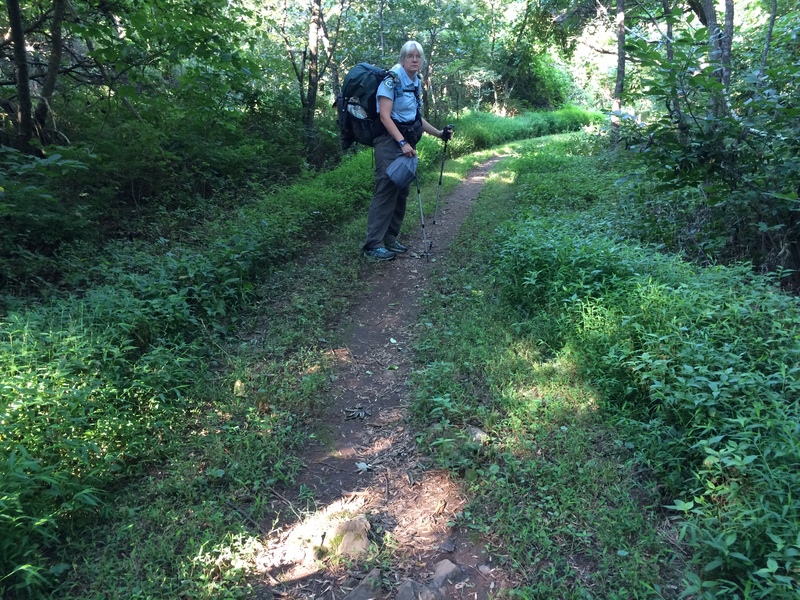 Lauralee, whose trail name is “Blissful,” trims briars. We stashed our trash at Beagle Gap for pick up later. That’s about three gallons worth. 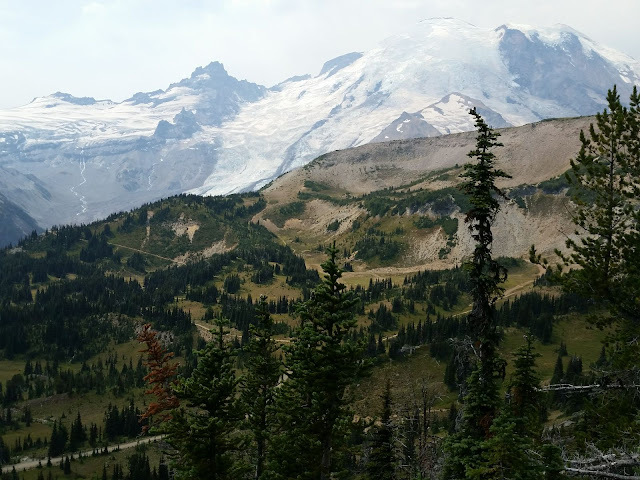 Many hikers want to become ridgerunners because they think the job is about hiking. It’s actually about education. The purpose of ridgerunning is to help hikers do the right things to take care of the trail and its surrounding environment. 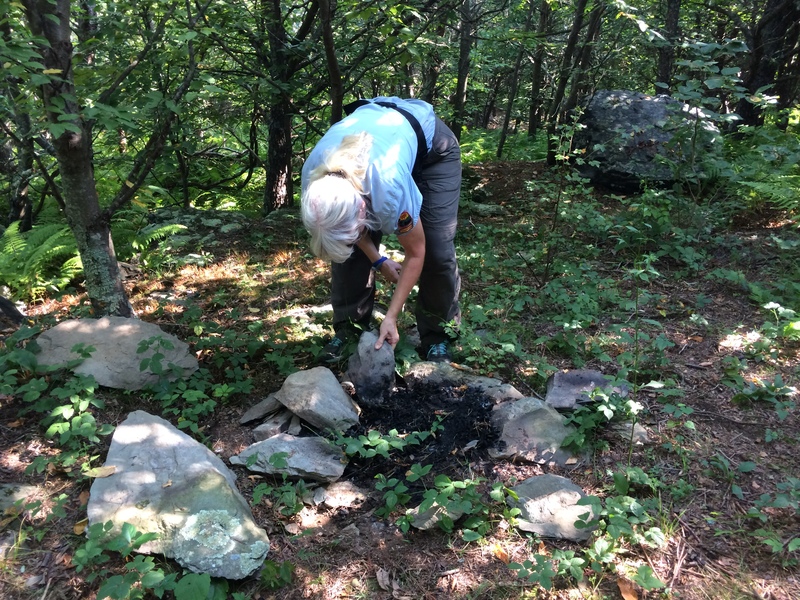 Among other duties, ridgerunners break up illegal fire rings. 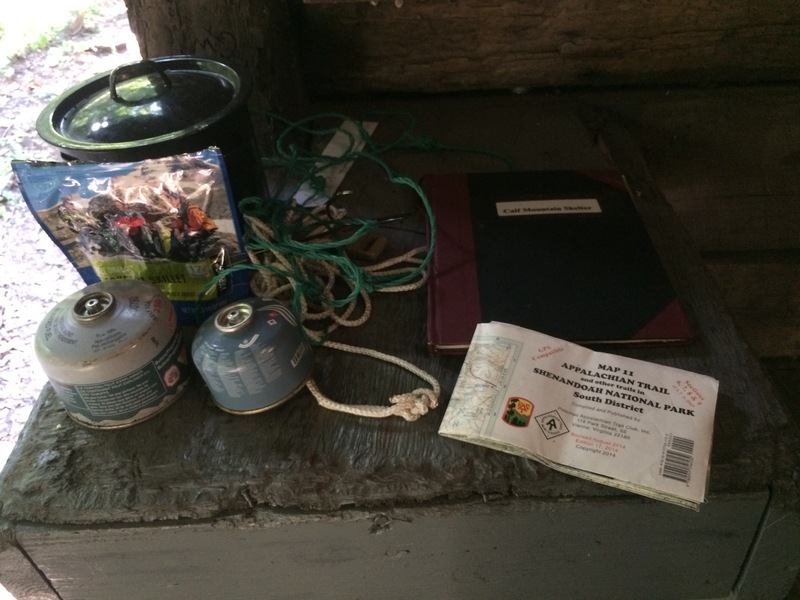 Ridgerunners help hikers understand how to “Leave No Trace” that they’ve ever been in the wilderness. https://Int.org . 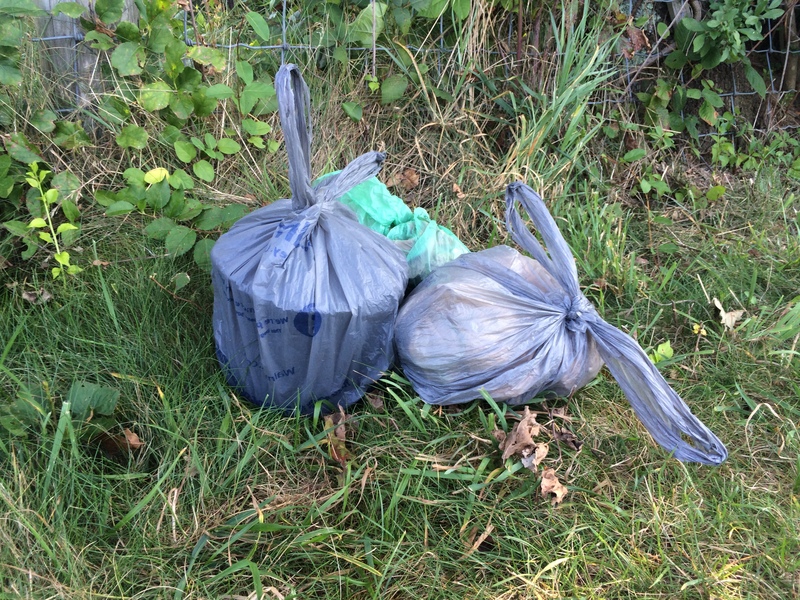 Ridgerunners pack out other people’s trash. It’s one of the distasteful parts of the job. 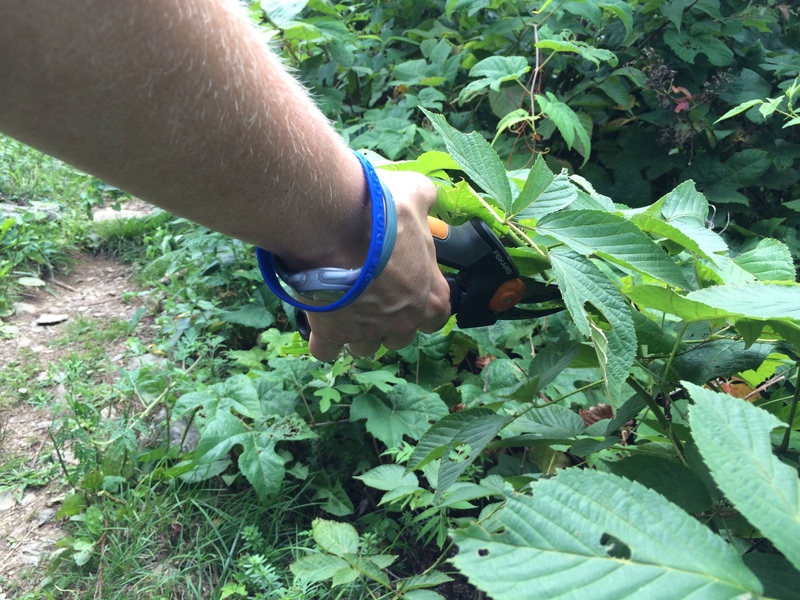 Best of all, ridgerunners help hikers. Here Lauralee helped this young college student with a pack shakedown that eliminated eight excess pounds of equipment that she did not need. One thing I learned about Lauralee is that she is a bear whisperer. On our last morning we found a young bear ambling in the forest. It probably is his rookie year away from his mother. When Lauralee talked to the bear in her soft blissful voice, his head cocked from side to side while his ears twitched in every direction like radar searching for UFOs. Maybe to him that’s what we were. I just know this: He left us with a gentle heartbeat and in the good spirits that reflected the extraordinary person with whom I was fortunate enough to share the weekend. I ran into Blissful at Elkwallow a month or two back when I stopped to grab a drink after yet another day spent clearing the weeds from my section. She saw me first and came over for a chat when she noticed my Overseer patches. I don’t necessarily recall the details of our conversation, save that we commiserated over how annoying weeding is. I was left with the impression that she genuinely enjoyed what she was doing, and that she was well-suited to doing it. It was a pleasure to have met her, however briefly, and an equal pleasure to be able to read more about her here. She is indeed a special person. All of SNP! That is truly impressive. I would have never guessed there was only one ridgerunner for that stretch. Lauralee is an interesting person. She had much experience and knowledge to share. Thanks for telling about her. Lauralee is an incredibly dedicated, knowledgeable, and nice! ridgerunner/backpacker. The A.T. is very lucky to have her. Jim I enjoyed your blog entry and am looking forward to ones you may do for your other Ridge Runners. 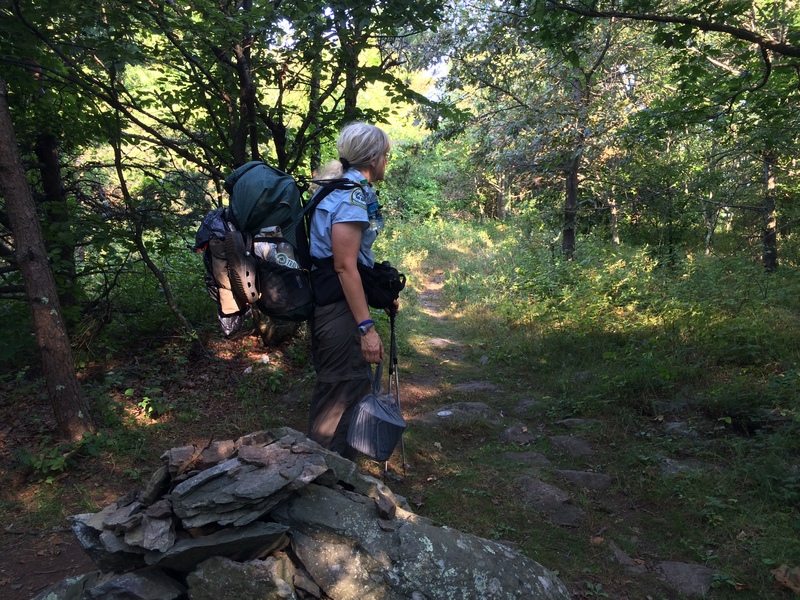 I included the blog that I do as an adjunct to my Trail Patrols on Old Rag. Its a little preachy because of its purpose. I have been keeping it for a pretty long time and the early years included information about both my PATC activities and my Old Rag Mountain Steward (ORMS) activities. I look forward to reading it. We did some work on Old Rag last month on a crew Mel led. It’s my favorite hike in the park. I use my blog more as a creative outlet, and a little education on the side. I am sorry to read about the scout troop and their lack of LNT. My own troop works very hard on this – the adult leaders feel strongly that it is part of our legacy to instill these values on the next generation. It bothers me that other troops apparently do not work on these same values, and that scouts in general get called out for the transgressions of those few troops. I’ve been involved off and on with Scouting since 1960. The adult leadership makes all the difference. I met many scout troops on my AT thru hike last year. Unfortunately the troops which were scrupulous in following LNT were a small exception to this example. In contrast, while ridge running in Georgia this spring, I delightfully noticed that Eagle Scouts set a high example for their fellow hikers.